Join the discussion on our forums! Come discuss Wickerflame Burnbristle over in our dedicated Wickerflame Burnbristle discussion topic. Wickerflame spent years as a recruit for the Goons, never making the big-time because he always fired his chest-cannon too slowly. "Hey," he thought, "maybe if I keep my beard lit on fire, I can do this faster." BOOM, promoted. Pulled a golden one of these recently. Considering that I'd pulled (and dusted) a normal one before, I think I'll keep this one. Maybe Blizzard just really wants me to play more Paladin. with the new Glowstone Technician this guy has been pretty fun to use in wild! 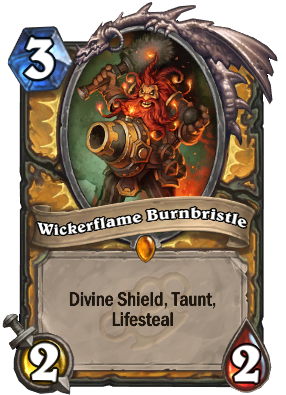 Confirmed during the final card reveal stream with Kibler and Brode, Wikerflame now has the lifesteal text. Now there is the new common card called Acolyte of Agony that has 3 attacks. and similar lifesteal. If two of them hit and kill eachother, Wickerflame Burnbristle will heal you for 4 healths, whereas Acolyte of Agony will heal you for 6 healths. I don't know what your exact point is...but YES, Acolyte of Agony is a 3 3/3 with Lifesteal BUT it' a PRIEST Class ONLY card. Assuming this card will be labeled Lifesteal once they load in the new set. This card was designed as a handbuff mechanic, how strong is the effect that even as a 2/2 is mandatory on every Pala deck thats not Aggro. "how strong is the effect that even as a 2/2 is mandatory" what? Nice easter egg! That dude played Sherlock truly well! At least him and Hydrologist synergize well. Got this guy from a pack, tried him out. Currently run him in an experimental dragon / buff midrange paladin and works exceptionally well! Against aggro as an early 2/2 divine shield taunt he saves me about 8 - 12 hp and kills a minion or two, and in slower matchups when I buff the hand and my opponent has no removal he heals me back up and causes trouble. great card! edit: HUWAAAAH, I'M ON FIRE! should just be an epic, this is the new Mistress of Pain nothing special or new. Doesnt even have a pirate archtype. For one, she was Warlock only, so that's a dumb statement to start. Also she didn't have divine shield, something Paladin can take good advantage of. Seems you don't really know this game at all. This minion isn't amazing solo, it's how you run it in combinations. One of my favorite card flavors. His music when played! Attack sound! Card art and flavor text! Really outstanding.